8 Again, the Devil took Him up into an exceeding high mountain, and showed Him all the kingdoms of the world, and the glory of them; 9 And said to Him, All these things will I give You, if You will fall down and worship me. 10 Then said Jesus to him, Get you back, Satan: for it is written, You shall worship the Lord your God, and Him only shall you serve. 11 Then the Devil left Him, and, behold, Angels came and ministered to Him. Recently I’ve taken to reading the Catena Aurea (English title: The Golden Chain). 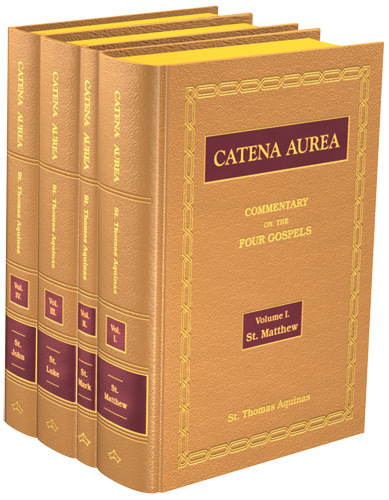 It’s a commentary on the four gospels by Saint Thomas Aquinas, entirely made up of commentary cut up from the early Church fathers and spliced together right after the verses under discussion. Amazingly, while none of the words were originally composed by Aquinas, the work as a whole feels as if it was written by one author as I read it. It’s long, though it doesn’t feel like a slog reading the kindle edition. PSEUD-CHRYS. Observe how Christ when Himself suffered wrong at the hands of the Devil, being tempted of him, saying, If you be the Son of God, cast yourself down, yet was not moved to chide the Devil. But now when the Devil usurps the honor of God, he is wroth, and drives him away, saying, Go your way, Satan; that we may learn by His example to bear injuries to ourselves with magnanimity, but wrongs to God, to endure not so much as to hear; for to be patient under our own wrongs is praiseworthy, to dissemble when God is wronged is impiety. So, to hide one’s beliefs when God is wronged is impiety. I have recently found myself blogging in defense of God and the teaching of His Church. Sadly, the attack that occasioned this defense came from the pope. But, and I think Pseudo-Chrysostom would back me up here, it would be wrong of me to keep silent. To smile and act like everything that Pope Francis says is the inspired word of the Holy Ghost, to pretend that all is well when much is ill; these would be impiety. “Piety” can be understood in several senses, but the one that makes the most sense in this context is “[t]he faithful performance of religious exercises; worship, adoration, thanksgiving, and fidelity to God’s law are all contained in the true concept of piety.” 1 To dissemble when God’s law is wronged harms one’s fidelity to God’s law, which is a part of piety. Even when God is wronged by the pope? Yes, even then we cannot dissemble.